As I wrote the other day when I began this series for first-time Del Mar visitors to the Breeders' Cup, I've been coming to the races at Del Mar since 1979. So much has changed in and around the track since then, but there's been one constant, Bully's restaurant and bar, a longtime horseman's hangout on Camino Del Mar in the sleepy downtown one mile south of the racetrack. Opened in 1969 by horse owner George Bullington and trainer Lester Holt, Bully's was built with an English Pub atmosphere in mind and has long been known for its steaks and prime rib. 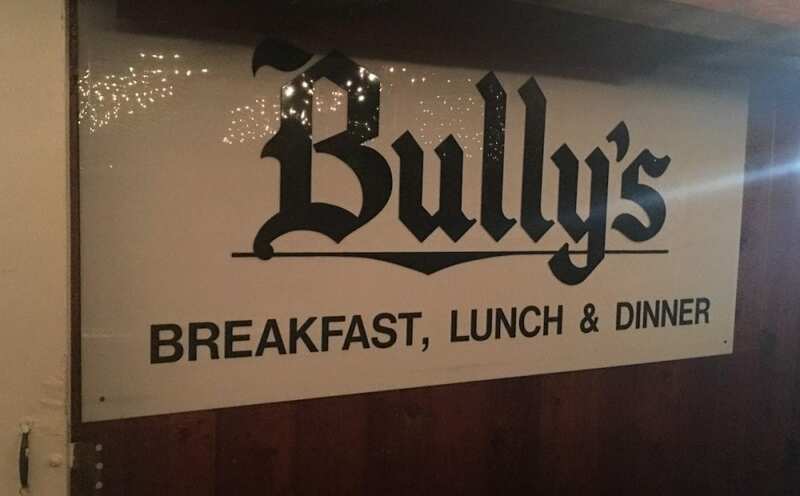 Its original owners have passed away, and Bully's may be gone before long, too. A restaurant group has purchased the property and brought plans to the Del Mar city officials to raze the historic building and replace it with a modern, upscale eatery. Not sure I'd call that progress. Though you might find a better cut of beef elsewhere in the area, I've never had a meal there I didn't thoroughly enjoy, and you won't find anything with the history that Bully's can claim. It was the hangout of Charlie Whittingham and Bobby Frankel, among many others, and you'll find remnants of some racing legends inside the place. 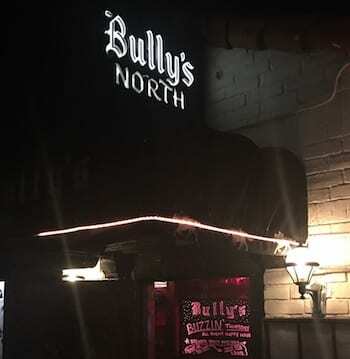 If you happen to be traveling solo, Bully's has a “low bar” for dining at the end of the cocktail bar. Right next door to the temporary “Barn at the Beach” on Coast Boulevard is Jake's Del Mar and Poseidon Restaurant. Both have been there for years, going back to when passenger trains stopped at Del Mar station (it's now a parking lot) across the street. It's where my racing buddies and I would grab a drink and wait for the train heading back north to Los Angeles after the races. Today, both Jake's and Poseidon serve excellent lunch and dinners and sit just off the sand of Del Mar beach so are a perfect spot to have a cocktail and watch the sunset. Pacifica Del Mar, located across from the L'Auberge Del Mar hotel high atop the Del Mar Plaza, has been open 28 years and offers consistently creative and delicious meals and has a distant yet stunning view of the Pacific Ocean. Then, of course, there's Brigantine, or The Brig as most people call it. Sitting at the corner of Camino del Mar and Via de la Valle and with a sweeping view of Del Mar racetrack, The Brig has a lively bar atmosphere, serves very good food and has the best fish tacos I've ever had. My taco recommendation is swordfish, with calamari a close second. Red Tracton's is just down the hill from The Brig on the other side of Via de a Valle, and it's best known for generous portions of steaks and prime rib. Red's is a fun atmosphere, especially at the dining tables in the bar. Founded by the late Los Angeles restaurateur Red Tracton, it's been a go-to place for racetrackers since 1988. If you like fish and a more casual atmosphere, you might give the Del Mar Fish Market a try, though my experience more recently is it can be hit or miss – both from a food and service standpoint It's located across from the track at the intersection of Via de la Valle and Jimmy Durante. 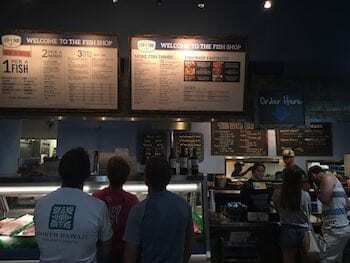 The Encinitas Fish Shop is popular with locals. For fish in a casual atmosphere, I much prefer driving up the coast to Encinitas and going to Fish 101 north of town or the Fish Shop Encinitas just south of the downtown area. Both are relatively new and extremely popular with locals and have the same routine: order at counter, telling them the type of fresh fish you want (there are usually a half dozen to choose from), how you want it served, cooked and seasoned, and what sides. They've got a good selection of local craft beers and wines. Take a number to a table and they'll bring your food to you. Casual but delicious. A bit more formal and one of my favorite places north of Del Mar is Pacific Coast Grill in Cardiff, which is just north of Solana Beach. It combines an exquisite ocean view with outstanding food and drinks, and excellent service. 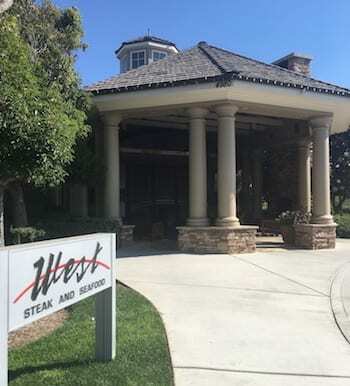 In saving the best for last, I can safely say my favorite steakhouse in the area is West Steak and Seafood in Carlsbad, a dozen miles north of Del Mar racetrack on Interstate 5. It's worth the drive. Owned by horse owner Gary West, who with wife Mary will have West Coast going for a sixth straight victory in the $6-million Breeders' Cup Classic on Nov. 4, West Steak and Seafood is an authentic farm to table fine dining restaurant that gets its produce from nearby West Farm and offers an extensive wine list. It is every bit as good as West Coast looked in winning this summer's Travers Stakes at Saratoga, and numerous restaurant awards suggest I'm not alone in that belief. These newer restaurants served as a perfect complement to some of the old standbys in Del Mar. But this list doesn't even scratch the surface of the many memorable dining options in San Diego County. Earlier installments of this travel guide are here and here. This entry was posted in NL Article, Ray's Paddock and tagged 2017 breeders' cup, breeders' cup travel guide, brigantine, bully's, del mar breeders' cup, jake's, poseidon, Ray Paulick, red tracton's, the brig by Ray Paulick. Bookmark the permalink.